"All the world will be your enemy, Prince of a Thousand enemies. And when they catch you, they will kill you. But first they must catch you." 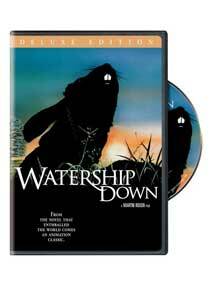 In 1972, Richard Adams' first novel Watership Down became a major success in Britain and around the world. His tale of rabbits struggling to find a new home struck a chord with adults and children alike and built a large audience. A film version seemed like an easy choice, but could an adaption retain the core elements of the book? After struggling to gain financing, director Martin Rosen employed a large group of artists, animators, and well-known British actors to create the animated picture in 1978. It earned serious acclaim and continues to receive notice 30 years after its original release. Art Garfunkel's Bright Eyes single reached number one on the British charts, which helped to increase visibility. This version's credentials are without question, but can it still succeed with modern viewers? The answer is not as easy as you might expect. Watership Down chronicles a group of rabbits who flee their warren based on the visions of Fiver (Richard Briers), who foresees its destruction. Although their leaders refuse to believe his prediction, a small team decides to heed his warnings. The journey is not easy, with possible enemies facing them at every turn, including the most dangerous menace, man. Their final destination is Watership Down, but even that is not the perfect haven. Nearby, General Woundwort (Harry Andrews) rules the Efrafra warren with an iron fist, creating danger for our daring group. This story lays the groundwork for recreating Adams' vision, which connects to serious issues that exist within our society. The early segments present our uncaring destruction of nature through "progress" and its ramifications on other species. The Efrafra's policies are easily identified in the actions of many governments, including the present-day United States. As you can see, there is a lot more going on here than just a simple story about talking rabbits. Their human characteristics, embodied well by the voices of actors like John Hurt and Richard Briers, bring more weight to their struggle to survive. There's also a spiritual element, introduced in the opening segment with the rabbit's creation story. This lengthy monologue is hard to follow and almost certainly works better on the printed page. Later in the story, the images shown while Garfunkel's song plays maintain a religious feeling that's surprising for an animated feature. This is not a shallow picture, but these larger issues weigh down the story and make it a slow experience. I enjoy it when animated features move beyond the obvious comedic formula, but this film's approach sometimes removes the energy from the images. In adapting Watership Down, Rosen makes a valiant attempt to retain Adams' story and avoid watering it down for the screen. I'm not an expert on the novel, but it appears that he succeeds in dodging the typical pratfalls faced when shifting a book to the visual medium. However, this animated tale seems to work better on the page and actually loses steam as a movie. The first 45 minutes employ an extremely deliberate pace that could lose even patient viewers. The terms from the rabbits' mythology are hard to follow if you're not an avid fan of the book. There is no simplifying going on here. The violence also remains, making this a PG-rated film that might not be right for young viewers. Rosen's authentic approach works as an intellectual project but fails to produce a classic piece of entertainment. Image Transfer Review: Watership Down is about 30 years old, and the age shows with some fuzzy animation. The overall quality is okay, but it falls well short of the wondrous remastering of more prominent releases. It doesn't hinder your understanding of the story, but could be frustrating if you're expecting a top-notch "deluxe edition." There are grainy images and frequent light adjustments that are pretty rare on most DVD releases. Audio Transfer Review: Although it's slightly better than the image, the audio lacks power and offers one of the wimpier tracks that I've heard recently. The 2.0-channel Dolby Surround does little with the music and just isn�t clear enough to really sell the film. My volume was at near maximum and it was still a pretty quiet experience. I'm guessing that it wouldn't have taken a major investment to clean up the sound and widen the field. Extras Review: This release includes a few extras, but they fall short of matching the expectations of the "deluxe edition" title. Watership Down: A Conversation with the Filmmakers brings director Martin Rosen and editor Terry Rawlings together to recount their experiences adapting the book. They discuss the film's genesis, its unique animated look, the background sounds and music, Art Garfunkel's hit song, and the overall phenomenon. This 17-minute interview gives a nice overview and delves briefly into the spiritual aspects of the story. In Defining a Style, the artists and animators describe their experiences bringing Richard Adams' creations to the screen. They focus on the individual characters and scenes that stand out from their production experiences. Even Actor Joss Ackland appears in this 12-minute feature, which offers a good deal of information. Finally, the storyboard comparisons present several key sequences, including the opening scene. Although Watership Down fell short of my expectations, it still deserves true deluxe edition treatment. Instead, we get some minor featurettes and mediocre audio and video transfers. The negatives make it hard for me to recommend this DVD. It might be worth a rental for curious new viewers, but is hardly worthy of being called "deluxe."